Semtech will showcase its newest optical networking solutions at OFC 2016 in Anaheim, Calif.
Semtech Corporation (Nasdaq: SMTC), a leading supplier of analog and mixed-signal semiconductors, announced the production release of its industry-leading GN2108 and GN2109 chipset for quad channel 100G-SR4 optical interconnects operating at 25.78Gb/s. The GN2108 is a quad channel CDR with integrated vertical cavity surface emitting laser (VCSEL) drivers, and the GN2109 is a quad channel CDR with integrated transimpedance amplifiers (TIAs). A full suite of on-chip features minimizes external components and helps customers speed up their hardware and firmware development. The GN2108 and GN2109 chipset offers customers developing optical modules, active optical cables and optical interconnects best in class link performance, high flexibility and a low overall solution cost. The GN2108 VCSEL driver was architected to compensate for optical distortion introduced by VCSELs. This enables several benefits, including extended reach well beyond the SR4 standard to greater than 300m over OM4 fiber, operation with lower bandwidth and lower cost VCSELs, as well as operation with lower VCSEL bias settings for lower power and higher VCSEL reliability. The GN2108 and GN2109 chipset’s comprehensive digital circuitry, together with a set of Analog to Digital (ADC) and Digital to Analog Converters (DAC), implements a complete set of alarms and monitoring, which simplifies module-level firmware design and enables the use of cost-effective Micro Controller Units (MCUs). In addition, the GN2109’s excellent input sensitivity makes it ideal for SR4 as well as PSM4 optical interconnects. 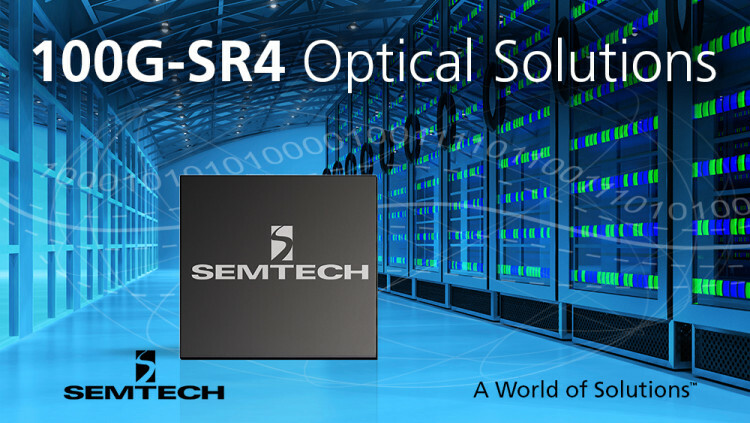 Semtech is a leader in the supply of optical module ICs for the PON, datacenter/enterprise and wireless backhaul markets. Semtech high performance PMD and CDR products range from 1Gb/s to 100Gb/s and lead the industry for performance, power and features. Semtech will have a demonstration of the GN2108 and GN2109 at the Optical Fiber Communication Conference (OFC) at Semtech’s booth 1383 by appointment. Enables greater than 300m of reach on multi-mode OM4 fiber, and greater than 150m of reach on multi-mode OM3 fiber. Enables use of lower bandwidth and lower cost VCSELs for 100G-SR4 applications. The GN2108’s output driver compensates for the optical distortion introduced by VCSELs to enable extended reach well beyond the 100G SR4 standard, and operation with lower cost, lower bandwidth VCSELs. The GN2109 offers excellent receiver sensitivity and crosstalk performance for both SR4 multi-mode and PSM4 single-mode applications. The chipset is highly integrated with a full suite of alarms, monitoring and test features to reduce the need for expensive MCUs, enable faster time-to-market (with reduced need for firmware design), and aid in module debugging and production testing. The GN2108 and GN2109 are in initial production now. Semtech offers comprehensive design assistance, including field- and factory-based support. Data sheets, volume pricing and delivery quotes, as well as evaluation kits and samples, are available at www.semtech.com/info. All statements contained herein that are not statements of historical fact, including statements that use the words ”will,””enables,” “offers” or “architected to,” or other similar words or expressions, that describe Semtech Corporation’s or its management’s future plans, objectives or goals are “forward-looking statements” and are made pursuant to the Safe-Harbor provisions of the Private Securities Litigation Reform Act of 1995, as amended. Such forward-looking statements involve known and unknown risks, uncertainties and other factors that could cause the actual results of Semtech Corporation to be materially different from the historical results and/or from any future results or outcomes expressed or implied by such forward-looking statements. Such factors are further addressed in Semtech Corporation’s annual and quarterly reports, and in other documents or reports, filed with the Securities and Exchange Commission (www.sec.gov) including, without limitation, information under the captions “Management's Discussion and Analysis of Financial Condition and Results of Operations” and “Risk Factors”. Semtech Corporation assumes no obligation to update any forward-looking statements in order to reflect events or circumstances that may arise after the date of this release, except as required by law.